All salmon spawn in freshwater and are “anadromous”. This means that to complete their life cycle, juvenile salmon must migrate out to the ocean and return as adults to reproduce in the river where they were born. The ability of the adults to return to the place where they were born is called “homing”. The process of juvenile salmon adapting their bodies from freshwater to saltwater as they migrate out to the ocean is called “smolting”. Salmon that are in this life stage are called “smolts”, and are generally studied in estuaries, where freshwater and marine systems intermingle. Figure 1. The salmon life cycle. The amount of time spent in each life stage varies depending on the species. For more information on the salmon life cycle, check out this Youtube Video. Source: Salmon Facts Work. Like many people, I love eating salmon, and I was surprised to learn that many populations of several salmon species are listed as threatened, endangered, or are even extinct from their native ranges along the West Coast. This is mostly due to overfishing during the 19th and 20th centuries, as well as continued human impact on the environment, including pollution, warming temperatures, and dams that block key freshwater habitat. Because of their strategy of “homing”, a population of salmon will continuously return to the same stream, creating genetically distinct groups that can be listed as threatened or endangered under the Endangered Species Act. This makes restoration of specific spawning grounds crucial, as salmon need to be able to return to their birthplace to complete their life cycle and produce offspring. The benefit of this is that scientists can track populations of salmon that always return to the same stream and try to figure out why that particular group within the species might be struggling. Due to their high value as a commercial and cultural resource throughout their range, salmon have been intensively studied along both coasts of the United States for years. It is difficult to track a species like salmon in the ocean, so researchers primarily study them in estuaries and freshwater streams, both as the juveniles that migrate out, and when they return as adults. The timing of these life events is of high interest to fisheries biologists because it may impact the survival and number of vulnerable populations of salmon. When biologists focus on studying periodic plant and animal life cycles, this is known as “phenology”. As global temperatures have increased over the last century, researchers have documented shifts in the timing of life cycle events in many species, likely because of changes in environmental cues. However, not all species are shifting their timing at the same pace, or even at all. This can cause biological mismatches in the relationships between species, including predator/prey interactions, which will have cascading effects for the health and success of all species involved. For example, imagine you are attending an event that is serving dinner buffet-style. You know they’re putting dishes that comprise a balanced, delicious dinner out at 5pm, your favorite dishes will likely be gone by 6pm, and after 7pm, there will only be crackers and coffee. If you’re hungry, you’d want to make sure you got there at 5:00! Past research has shown that survival during the first year at sea for salmon can be a controlling factor for maintaining the size of a population, and survival is higher when out-migration is timed with the peak of prey abundance in the ocean. The purpose of this study was to see if a population of Sockeye Salmon exhibited phenological diversity, i.e. if individuals within the population migrated from freshwater to the ocean at a variety of times throughout the season, and to examine if that is related to where they were born within the watershed, and/or the availability of a key marine and estuary food source (zooplankton). The Skeena River drains an area of approximately 55,000 km2 and supports the second largest average return of Sockeye Salmon in British Columbia, with at least 30 genetically distinct populations throughout the watershed (Figure 2). Salmon smolts were captured in the Skeena River estuary in 2013 and 2014 during weekly sampling events from May to July. A genetic sample was taken from a subsample of these fish (up to 100 individuals per day, and up to 300 individuals per week) to determine where each smolt came from within the watershed. Researchers used these data to determine the peak migration of smolts for each population for both years (2013 and 2014) and compared this to peak zooplankton availability and water conditions. 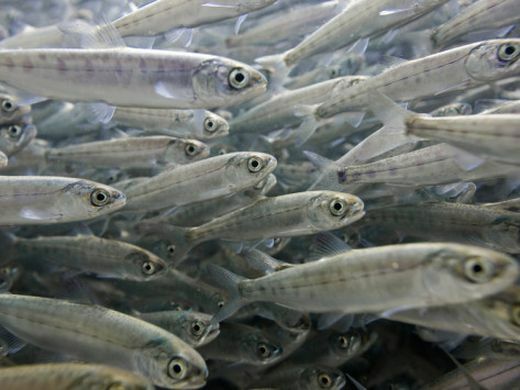 They found that different populations of Sockeye Salmon within the Skeena River exhibited different smolt migration timing, with a 36-day spread between the first and last populations’ peaks in migration. This pattern appears to be connected to where in the river system they were born – salmon from further upstream and from higher latitude and elevations took longer to migrate to the estuary. They also found that the different populations of sockeye encountered different zooplankton prey communities in the estuary, depending on their arrival time. Figure 2. Map of British Columbia’s Skeena River system. Sockeye Salmon were captured in the estuary (where red arrow is pointing). Source: Ocean Ecology. The geographic pattern of smolt out-migration timing was more pronounced than the researchers expected. Different populations of Sockeye Salmon encountered different zooplankton prey communities in the estuary based on what time they migrated to the estuary. Because of this, the quantity and quality of prey varied among salmon populations. Opportunities to feed on higher-quality prey are likely help smolts recover from their long journey downstream from the spawning grounds, so this pattern may also affect ocean survival, and eventually future population sizes. In this study, the timing of peak abundance for most of the observed zooplankton varied between 2013 and 2014, while the timing of peak abundance for juvenile Sockeye Salmon smolts and the order of the populations entrance into the estuary remained relatively consistent across years. If this pattern continues, the populations that repeatedly match up with peak zooplankton availability will have an advantage in surviving for the rest of their life cycle – they get the full buffet. The populations that repeatedly do not match up will have a disadvantage – they have to rely on coffee and crackers. As we struggle to manage dwindling salmon populations throughout the West Coast by battling centuries of negative human impacts, it is important to continue to learn all we can about the life cycle patterns of these fish.